Deals significantly less damage, but heals you or an ally near the enemy. Reduces the cost, grants Minor Resolve and Minor Ward. Stonefist: Slam an enemy with solid rock, dealing [3690 / 3732 / 3771 / 3812] Magic Damage and stunning them for 3 seconds. Deals 100% more damage if you successfully stun the target. Obsidian Shard: Area: 28 meters. Slam an enemy with solid rock, dealing [1537 / 1553 / 1570 / 1588] Magic Damage and stunning them for 3 seconds. Heals you or an ally near the enemy for [8301 / 8393 / 8483 / 8575] Health. Stone Giant: Cost: 3240 Magicka. Slam an enemy with solid rock, dealing 3809 Magic Damage and stunning them for 3 seconds. Deals 100% more damage if you successfully stun the target. You gain Minor Resolve and Minor Ward, increasing your Spell Resistance and Physical Resistance by 1320 for [15 / 16 / 17 / 18] seconds. Stonefist deals physical damage and stuns enemies. 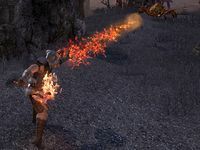 It is a good way to quickly disable a nearby opponent, either allowing you to deal with fewer melee attackers nearby, or to allow you to charge up a heavy attack or other ability as a follow-up. Obsidian Shard reduces the damage but also heals you or a nearby ally. Alternatively, Stone Giant will increase your Physical Resistance while having reduced cost. Some stronger opponents are immune to knock-down, though they will still take damage. Obsidian Shard is a recommended morph for the Dragonknight Initiate build. Obsidian Shard: Rank I of this ability now has the same travel speed as the other ranks. Obsidian Shard: Increased the damage of this ability by 20%. Stone Giant: This ability now grants the buff Minor Resolve instead of the previous unique increase to armor. Increased the range of this ability and its morphs to 28 meters from 20 meters. In addition, this ability and its morphs now deal Magic Damage, instead of Physical Damage. Obsidian Shard: Increased the healing from this morph by 16%. This ability and the Stone Giant morph now deal 100% increased damage if they knock down a target. Obsidian Shard: Increased the healing done by this morph by 20%, and decreased the damage by 20%. Increased the speed of the projectile fired by this ability and its morphs by 100%. Developer Comments: Since Stonefist is easy to avoid or anticipate with Roll Dodge and Block, we've increased the projectile speed to make it harder for enemies to counter. Obsidian Shard: Fixed an issue where this morph would not fire the heal if the target blocked or absorbed the damage of the initial hit. Obsidian Shard: Fixed an issue where the friendly heal from this morph could be dodged. Obsidian Shard: Increased the radius of the heal from this morph to 28 meters from 10 meters. Obsidian Shard: Increased the healing done by this morph by approximately 25%. Stone Giant: This morph now also grants Minor Ward in additional to Minor Resolve.